Vaping hemp oil may help help to reduce stress, anxiety and inflammation. It may also provide relief for those with sleep apnea, joint pain, high blood pressure and more. For use with CBD hemp vape oil only. 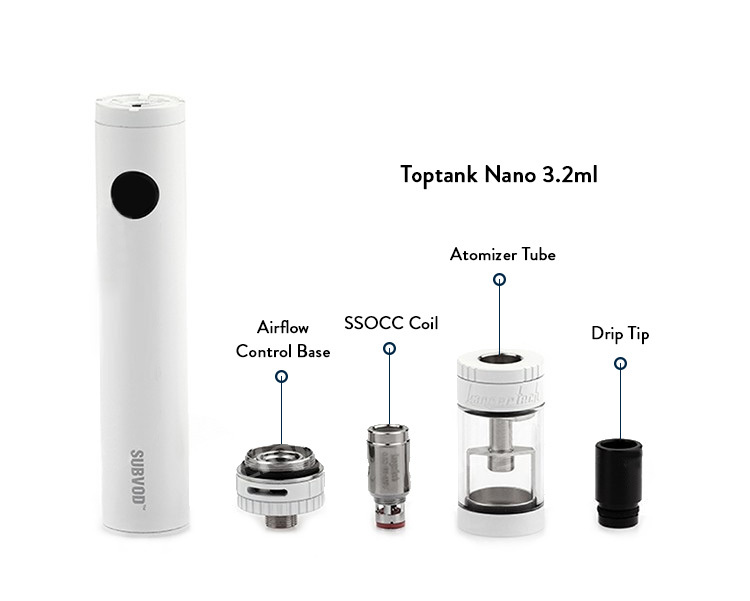 Great for those who want a sub-ohm vaping experience (The SUBVOD is fixed at 0.5 ohms and fires up the atomizer at 3.7 volts). Many vape pens allow you to adjust the voltage, but the SUBVOD is a starter kit, so the output is fixed at 3.7 volts, which is perfect for a sub-ohm experience for beginners who don’t want to fiddle around with settings before knowing how to do it. The SUBVOD is constructed of aluminum alloy and stainless steel, so you don’t have to worry about it falling to the ground as the body will withstand the shock. The measurements of this pen are: 18.5mm in diameter, 90mm in length, and 57g in weight. This is a nice portable size that is still slim and not at all bulky.